Deconstructing food is not easy, there is a thin line between fusion food and deconstructed ones. As per my understanding, a fusion recipe may have completely different ingredients in it along with the main ingredients of a traditional dish, but in a deconstructed recipe one needs to play only with the main ingredients of the classic dish. So, the challenge here is the limitation of the ingredients, and the fun part begins from there. The idea of creating Lobongolotika Butterfly Cups jumped into my mind suddenly last month, just like in a most usual way the other numerous ideas come and go this one stayed somehow. And I thought I should give this a try, very little did I know that I’d be ended up making something so pretty which I’ve never made before. 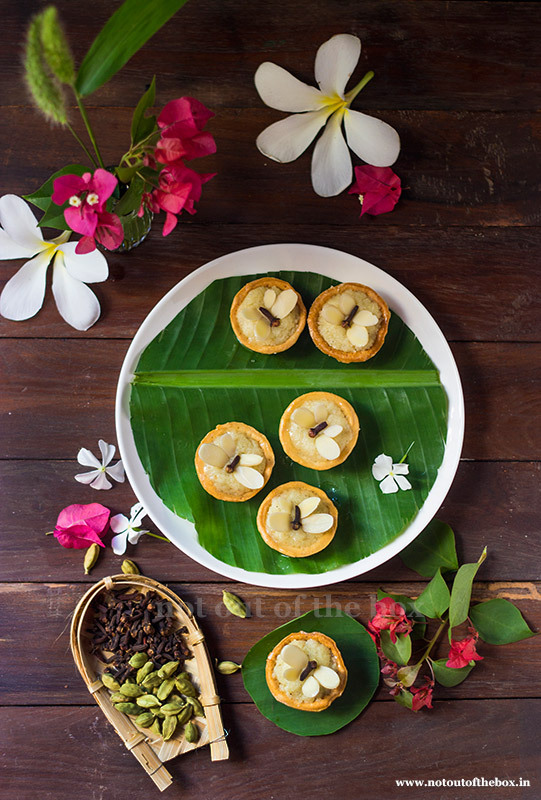 This is my take on our very own, popular Bengali sweet Lobongolotika, sealed with clove the crisp-sweet, mawa (khoya) filled pastry parcel of my childhood. 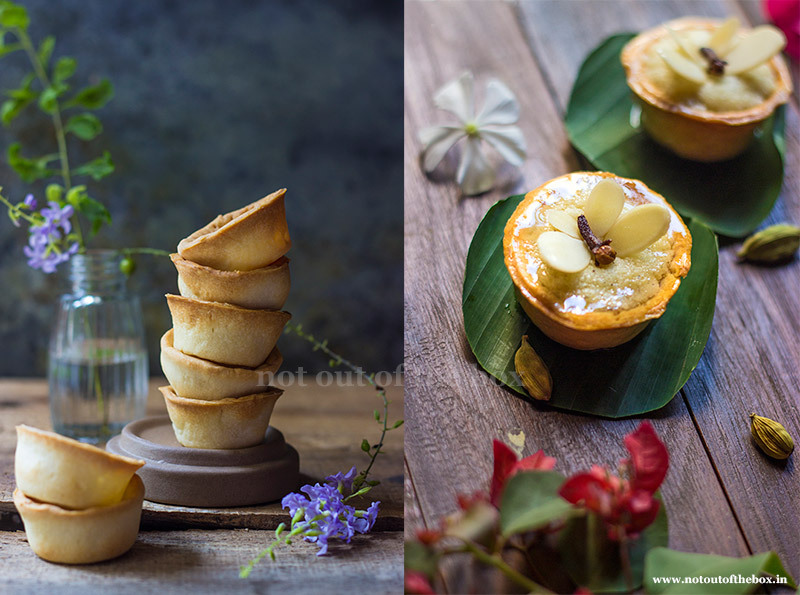 These Deconstructed Lobongolotika Butterfly Cups are my ode to Ma Durga, a little celebration from my home to the homecoming of our beloved Goddess. 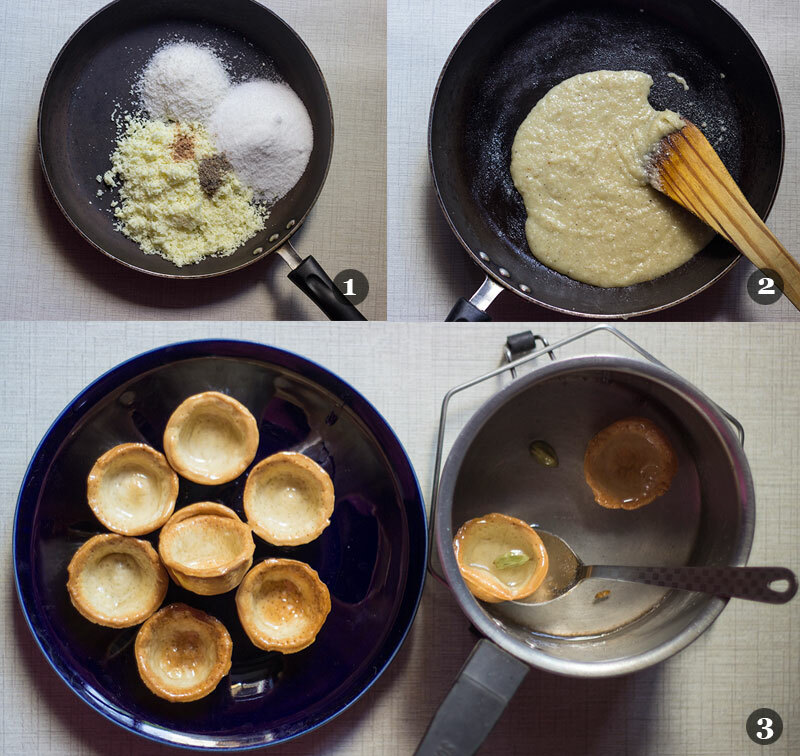 Prepare a small cavity cupcake tray by greasing with ghee. Mine was 8” X 11” tray with 12 cavities. In a bowl, mix flour and salt. Add 1½ tbsp ghee into this, mix well. Now add water in a small portion and knead the dough until smooth. Cover the bowl and let the dough rest for 30 minutes. 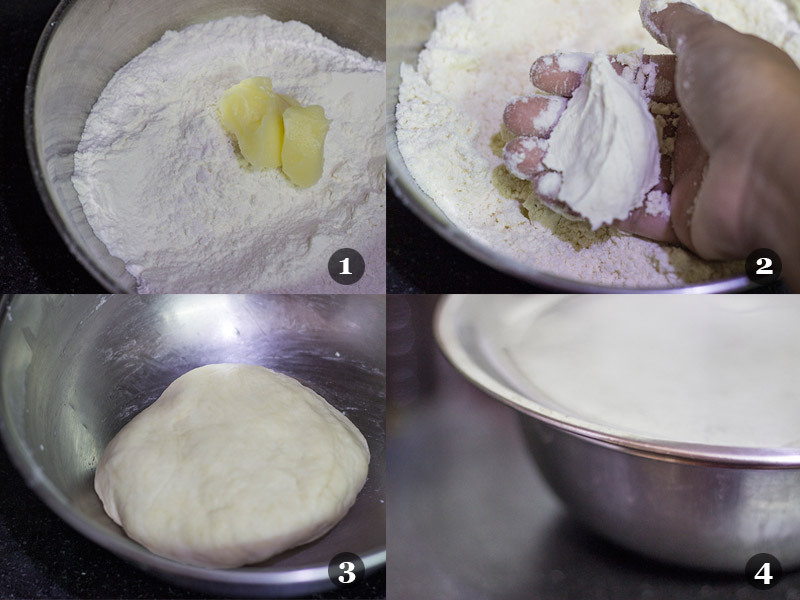 Divide the dough into two equal sized balls. 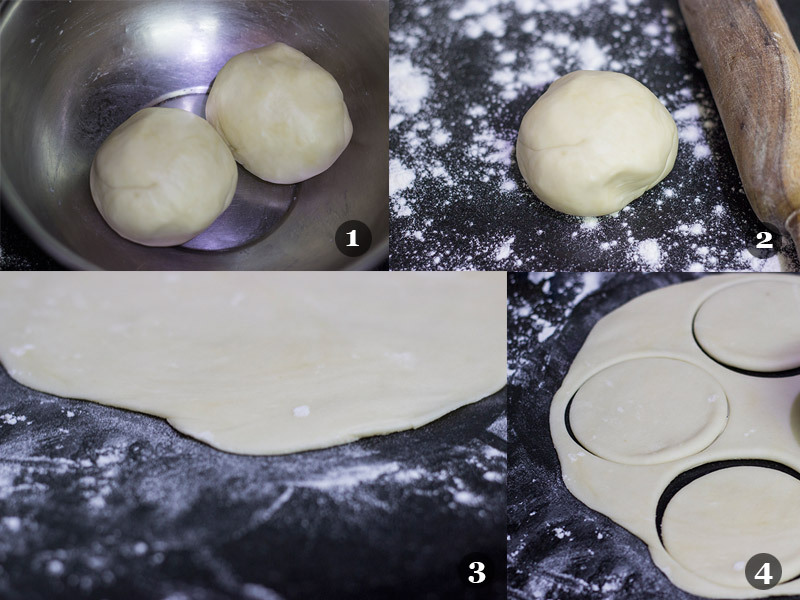 Now roll each ball on a lightly floured surface to 1/2 cm thick and cut round shapes using a circle shaped cookie cutter. Now shape these circles inside the cupcake cavities by using your fingers, trim off the excess edges with a knife from the top. Prick the insides of the dough cups with a toothpick or fork, care should be taken not to pierce them, do the pricking gently. When all the cups are ready, keep the tray refrigerated for 30 minutes before baking. Preheat oven to 200 degrees C. Take out the tray from the refrigerator and place it straight away in the oven. Bake for 20 minutes or until the cups turn light brown in colour. Remove them from the oven and transfer to a cooling rack and leave there until cool completely. In a saucepan add everything mentioned for the sugar syrup, boil and stir over medium heat until the sugar melts. Now lower the heat and cook the sugar syrup for 2-3 minutes more. You need to prepare the syrup in such a way so that, it doesn’t thicken too much, we’re looking for medium consistency sugar syrup here. Now dip the cups in the syrup one by one, and keep aside. You can do this with the help of a spoon. We need to syrup coat the cups from all the sides. Don’t leave the cups in the syrup for a longer time, otherwise, the cups will turn soggy. In a nonstick frying pan add everything mentioned for filling and start cooking over low heat until (5 minutes approx.) the mixture coming together. Remove from the heat, grease your palms with ghee and start to fill the cups with the mixture immediately. You need to do this fast otherwise the mixture might turn crumbly, and giving the filling a smooth finish from the top might become difficult. As you fill the cups keep on pressing the almond slivers and cloves in the shape of butterflies on top just the way I did for all the cups. Do this after filling each cup with the mixture. You can serve the sweets at room temperature. Store in an airtight container, keep refrigerated and consume within 7-10 days. 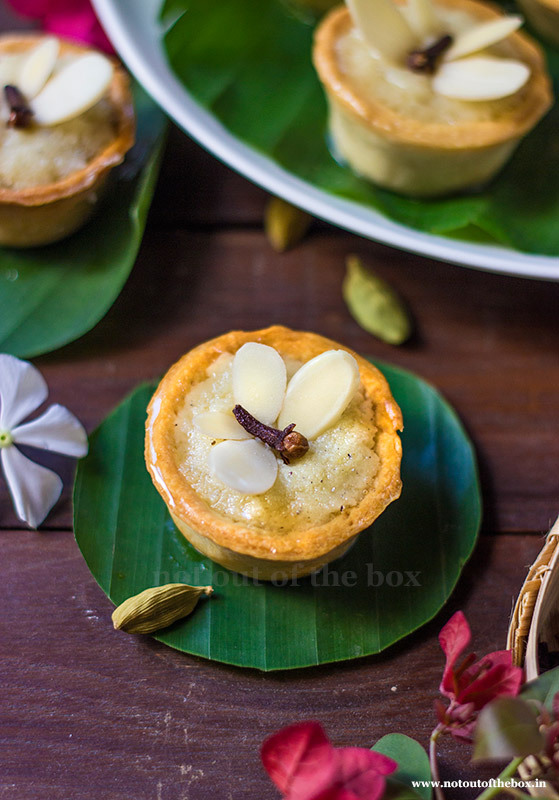 Lobongolotika Butterfly Cups are a deconstruction of the popular Bengali sweet Lobongolotika. Here the sweet got a completely new avatar with baked cups and edible butterflies on top. In a bowl, mix flour and salt. Add 1½ tbsp ghee into this, mix well. Now add water in a small portion and knead the dough until smooth. 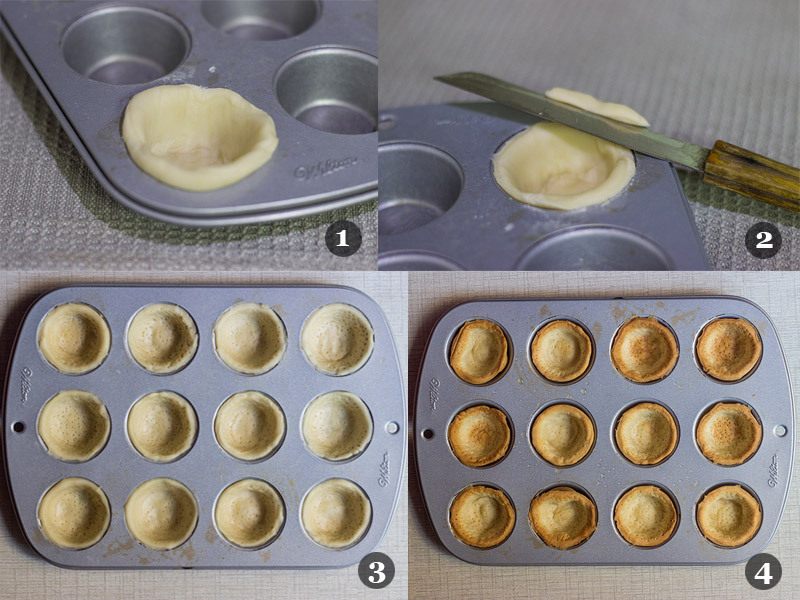 Now shape these circles inside the cupcake cavities by using your fingers, trim off the excess edges with knife from the top. Prick the insides of the dough cups with a toothpick or fork, care should be taken not to pierce them, do the pricking gently. When all the cups are ready, keep the tray refrigerated for 30 minutes before baking. In a saucepan add everything mentioned for sugar syrup, boil and stir over medium heat until the sugar melts. Now lower the heat and cook the sugar syrup for 2-3 minutes more. You need to prepare the syrup in such a way so that, it doesn’t thicken too much, we’re looking for medium consistency sugar syrup here. In a nonstick frying pan add everything mentioned for filling and start cooking over low heat until (5 minutes approx.) the mixture coming together. Remove from the heat, grease your palms with ghee and start fill the cups with the mixture immediately. You need to do this fast otherwise the mixture might turn crumbly, and giving the filling a smooth finish from the top might become difficult. As you fill the cups keep on pressing the almond slivers and cloves in the shape of butterflies on top just the way I did for all the cups. Do this after filling each cup with the mixture. 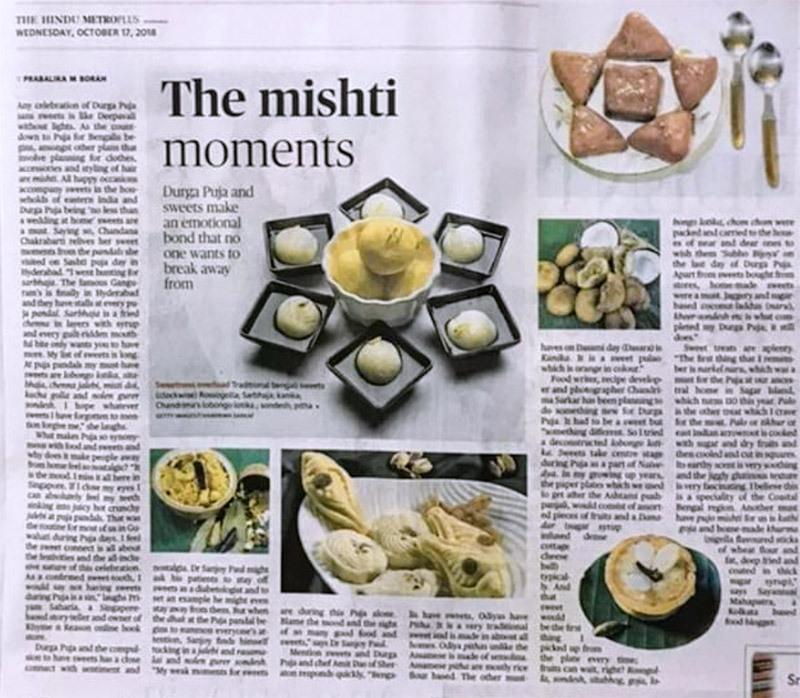 The Lobongolotika Butterfly Cups photograph and a quote about my Mishti memories Published on The Hindu.